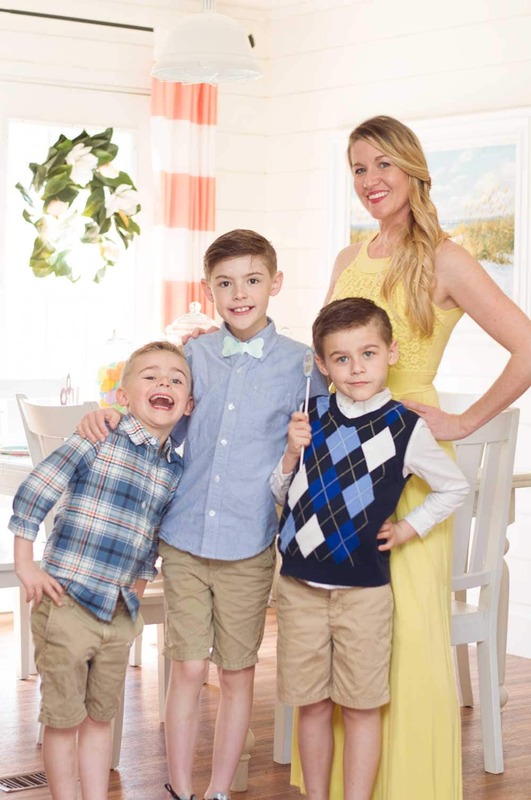 I am a stay at home mom of three boys, and have been married to my supportive husband for over 10 years. Crafting has always been a big part of my life since I was a child, and some of my favorite childhood memories are crafting with my mother and sister. I love spending time with my boys and making crafts with them! I know it’s hard being a mom sometimes. We all have a million things going on in our minds. But it doesn’t really matter if you’re a stay at home mom or a working mom. Believe me I’ve been both, and sometimes it’s easier to put the kids in front of the TV instead of planning activities and learning time. Since becoming a stay-at-home mom, I’ve realized it’s my responsibility to keep my children stimulated and active. I think having that time with your child to sit and be creative and to explore using texture, colors and (most importantly) their imagination is a great way to bond and teach at the same time. When I first started my website it was going to be all how-to kids crafts. But since I’ve been a stay at home mom I’ve wanted something for myself as well. So, I started creating holiday crafts for the house, which eventually turned into the DIY decor section of the site. I would get so excited when a holiday would come up so I could decorate the house! I loved making them so much that after the holidays I started decorating the house and painting old frames and mirrors trying to make them look new. I have seen all these wonderful ideas on Pinterest and really wanted to start taking my crafting to a whole new level. I loved making them so much that after the holidays I started decorating the house and painting old frames and mirrors trying to make them look new. Next, I started the party section because I just love throwing parties for the kids. My friends and I are all on a budget, so I wanted to share ideas that I’ve come up with or have seen out there so that you can have a great and unique party for your kids and stay on budget, as well. As of now, all the parties I have are kids themed, because who doesn’t love a kid party? I use any excuse to have one if a holiday is coming up. I’m all about having a party for the little ones. Plus, I get to spend some time with my mommy friends. These close friends and I all have kids the same age, and they have all become best friends so it really works out perfect for us! My greatest supporter in this new chapter of my life is my husband. Not only does he inspire me every day he has patiently created this wonderful website for me. He has worked very hard to make my dream come true and I’m very lucky to have him. He’s definitely my biggest fan and has always pushed me to do something that makes me happy. This has been an amazing time in my life. I’m able to spend my days with my little boys and do something that I love. Being creative is something I want to instill in my boys whether it be painting, writing, music or anything else they want to explore! My husband is a very creative person as well. Not only is he a web designer, he is an aspiring photographer too! We LOVE taking pictures and are learning new things every day to get better. I think Photography is a wonderful way to show your artistic side. Our favorite models are the children. There are so many different ways to be creative! Thanks for stopping by and learning a little about me. I hope you can get some wonderful inspiration for crafts with your children and find some ideas for yourself!! !